Unnecessary movements add no value and are therefore wasteful. They consume valuable production time and place additional strain on the worker. This is why all grab distances should be as short as possible. Grab containers and parts containers placed in direct reach of the employee are ideal. The containers should be arranged to allow for a flowing, ascending arch sequence of motions based on the body’s natural movement. Moreover, two-handed grabbing and joining can cut assembly time by up to 50%. The ergonomic design of the grab containers based on MTM (Method of Time Measurement) serves to effectively pre-separate the parts: the grab ledges have ridges to enable quick and secure part picking. For the space-saving and ergonomic supply of small parts such as nuts and screws. Vario grab containers are stackable. They can be mounted on strut profiles or on a base placed directly on the work surface. These plastic grab containers are sturdy and robust. The containers can be exchanged easily. 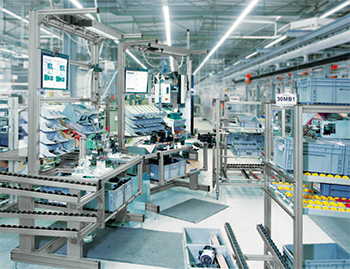 This allows for very fast order picking, part replenishment and workstation conversions. When used in combination with the material shelves at the workstation or in the material shuttle, these grab containers are suited for implementing the two-bin system (kanban). An ESD-conductive version of the grab containers is also available. Lettering clips for content labeling are included as accessories. Container mounts and the grab container rack are also available for optimally positioning the plastic grab containers.